Chocolate chip cookies were one of my favourite cookies growing up so I love making this recipe as a trip down memory lane. 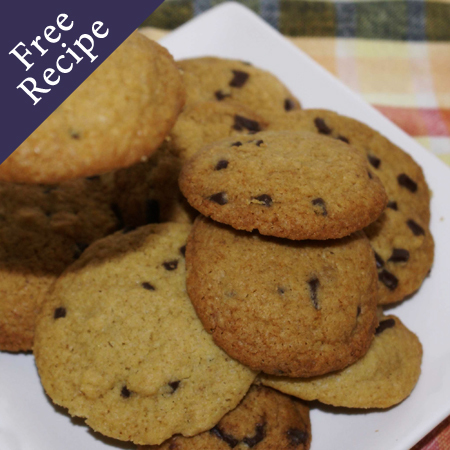 This recipe makes a lot of cookies and is really good for making giant cookies too. Quick and easy to do and I find they keep for weeks in an airtight container without going soft. Free From: Gluten, Wheat, Soy, Sesame, Potato Flour/Starch & Nuts. 1. Turn oven on to 170ºC (340ºF) fan bake. 2. Prepare up to 3 baking trays by covering with baking paper. 3. Put the first 7 ingredients into a large bowl (Baking Blend, soda, salt, sugars, vanilla & egg). 4. Mix through with a fork. 5. In a pot melt the butter and then add this to the large bowl and mix everything together well. 6. Lastly, add the chocolate chips to the cookie dough and mix through thoroughly to evenly distribute. Spoon in small teaspoon sized lots onto the prepared baking trays, allowing enough room between each cookie for it to spread to double its size while cooking. 7. Bake at 170ºC (340ºF) fan bake for 12 – 15 minutes until golden brown. 8. Remove from oven and transfer to wire rack to cool. 9. Repeat steps 7 – 9 until all the cookie dough is used up. 10. When cold, store in airtight container. These cookies can keep for weeks but are so irresistible they don’t usually last that long. Be careful to let your cookie dough cool slightly before adding the chocolate chips or they will start to melt and discolour the biscuits. *Recipe p.8 of the Goodness Me it’s Gluten Free Cookbook or the Gluten Free Cooking Starter Guide.